Find Amber and Madness Ore for two rival Blacksmiths. Talk to Dumag gro-Bonk at The Missing Pauldron or Cutter at Cutter's Weapons or find any of the Matrices. Locate Amber, Madness Ore and their specific Matrices. Give the Amber types to Dumag gro-Bonk for Amber weapons and armor. Give the Madness Ore types to Cutter for Madness weapons and armor. In Bliss there is known to be a master weapon smith who is able to fashion weapons and armor from Amber. Locate Dumag gro-Bonk at The Missing Pauldron and talk to him about 'Amber'. He will explain that he was an apprentice smith and learned to forge Amber from his master, who has since passed on. He gives you an Amber Materials List identical to the one hanging on the wall of his shop that explains how many pieces of Amber are needed to make each item. Dumag also explains that before his master died, she hid many special Amber Matrices around the Isles and if you can find one of them, he will be able to make a magical version of its type. Another master smith resides in Crucible. Cutter, the mysteriously dark but friendly Bosmer who runs Cutter's Weapons, is renowned for her abilities to craft weapons and armor from Madness Ore. Speaking with her will yield a story almost identical to Dumag gro-Bonk's: she too was trained by a master who hid many Matrices about the Isles before she passed away. Cutter will give you a Madness Ore Materials List listing the required number of pieces for each of the items, and explain she can use the Matrices to craft magical versions of the type found. The quest can never be completed since you can indefinitely collect the required materials, and finding the items is something that will happen almost inevitably during your travels. Amber can often be found on Gnarls and in Hollowed Amber Limbs, Hollowed Amber Stumps, and Hollowed Limbs found in root caves. On the other hand, Madness Ore can be mined from Madness Ore Deposits in certain ruins and is very often found on Grummites. The matrices are somewhat rare, but much more valuable, because they yield the best weapons and armor. 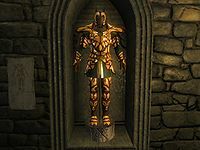 Each matrix is a mold of a specific piece of armor or weapon (e.g., Amber Cuirass Matrix, Madness Boots Matrix or Amber Arrow Matrix). In addition to the matrix, which cannot be reused, the smiths will require an amount of Amber/Madness Ore in order to make the weapon or armor. The enchantment for all weapons crafted from a matrix will always be Damage Health and for armor can be a Fortify Skill, Attribute, Reflect Damage, or Spell effect. The matrices can be found randomly in chests and urns or on creatures. Grummites are quite frequently known to possess Madness Matrices. Once you have obtained some Amber or Amber Matrices, speak with Dumag gro-Bonk again and he will ask what you would like to have made. You will only be shown items to craft that you have enough pieces for. Of course, on the other side of town, bring the Madness Ore or Matrices to Cutter, who will similarly ask what you would like and will craft only the items you have enough Madness Ore in your inventory for. Amber makes light armor whereas Madness Ore makes heavy armor; while both types make high-quality weaponry. The quality of the armor and weapons you get is based on your character's current level, so you will not get the very best items unless you are level 23+. What you get, though, is generally as good as the best loot you can find at your current level. Inside dungeons, 'Madness Ore Deposits' are surrounded by a sparkling green swirl, while 'Hollowed Out Amber Logs' are surrounded by a sparkling orange swirl. When you see one of these, look about the area to find the container. Note that these also appear outside, but do not mark a container. There is no way to end this quest as you can continually use the services of Dumag or Cutter. Much like the other citizens regards to the opposing district of New Sheoth, Dumag and Cutter have a high level of contempt for one another and will frequently make this known to you when speaking with them. Forging items is an effective method of making money, as the weapons and armor are worth considerably more than the raw Amber or Madness Ore.
3 samples of Amber and 2 samples of Madness Ore can be found in Shelden's House in Passwall. 4 samples of Amber and 2 samples of Madness Ore can also be found in Jayred's House in Passwall. 'Hollowed Out Amber Logs', Stumps and Limbs do not respawn Amber. Once you have emptied all of these the only way to acquire more Amber is from Gnarls or from boss level chests. The same goes for Madness Ore, which may only be acquired from boss chests or Grummites after supplies have been exhausted. 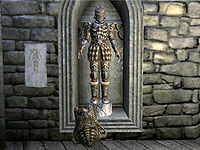 Although journal entries 26 and 126 suggest that no armor will be forged unless the player has reached level eight or higher, no such restriction exists and armor can be created at any level. 10 I've heard that a smith in New Sheoth is collecting Amber. I've found an unusual item called a matrix. It looks like a mold of some kind, and seems magical. I should ask around. Someone in the Shivering Isles must know what this is used for. 20 I've met Dumag gro-Bonk who lives in New Sheoth. He can forge things from Amber. 25 Dumag gro-Bonk told me Amber can be found in root tunnel systems and on Gnarl. 30 Dumag gro-Bonk told me about magical weapon and armor "Matrices" he can use to create magical weapons and armor. If I find a matrix he'll be able to make a magical item. 110 I've heard that a smith in New Sheoth is collecting Madness Ore.
120 I've met Cutter of New Sheoth. She can forge items from Madness Ore.
125 Cutter told me Madness Ore can be found in old ruins and is often carried by Grummites. 130 Cutter told me about magical weapon and armor "Matrices" she can use to create magical weapons and armor. If I find a matrix she'll be able to make a magical item. It is possible to use the console to advance through the quest by entering setstage SE30 stage, where stage is the number of the stage you wish to complete. It is not possible to un-complete (i.e. go back) quest stages. See SetStage for more information.